The team of professionals at Sears Garage have the skills and experience to repair nearly any garage door issue, including broken springs, and sensors. If you ever need garage door service, Sears can assist you with repairs or new door installation if needed. Ask us about our warranties, which are some of the strongest in the industry and our special financing offers. Give us a call at (818) 312-3747. The selection of garage doors at Sears is full of high-quality models, and styles. The experts at Sears can help you find the perfect option for a new garage door system to match your home's personality and style. Over time, garage doors can break and eventually wear out. If this has happened to you, call on your local Sears Garage Solutions team of experts to find out about your available options. Sears can assist with almost any repair-related issue. Whether you're dealing with an off-track door, malfunctioning sensor, broken spring, faulty opener system, or snapped chain, Sears Garage Solutions can help. Garage door openers are used multiple times per day on average, and eventually, they can experience issues. Consult with the experts at Sears for repair or replacement of your garage door opener system. The modern systems available today feature quieter operation, stronger and more efficient motors, and smartphone-enabled remote control. Welcome to the “Valley of the Stars,” Southern California’s San Fernando Valley, encompassing the City of Burbank, City of Calabasas, City of Glendale, City of Los Angeles and City of San Fernando. Beauty, style and reliability that’s affordable. Choose from several traditional style doors and build the door that is best for you, your home, and your budget. Replacing a Garage Door? Sears Garage Doors offers a variety of colors and styles for your new garage door. Whether you are looking for a high quality, well-insulated garage door or a basic garage door, you will find what you are looking for with our traditional garage door selections. For your convenience we offer free in-home estimates and knowledgeable sales associates to help guide you in selecting your new garage door. 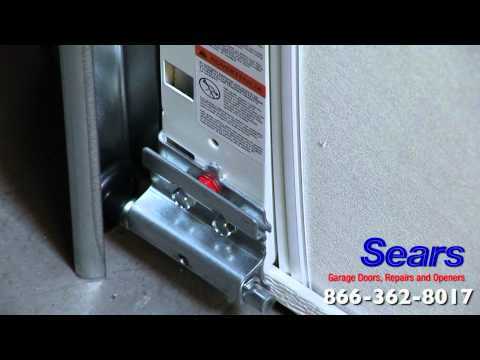 Call 818-312-3747 to schedule and appointment or visit www.searsgaragedoors.com for more information. Sears Garage Solutions is committed to your safety. All of our repair services include a 20-point safety check, which includes checking your garage door panels, springs, sensors, safety release, hardware, track, and more. Your safety is our #1 priority. Please remember - Garage door springs, cables and hardware are under extreme tension and could cause serious injury or damage. For this reason, only qualified technicians should adjust or replace them. In many cases, when the garage door spring breaks the garage door is already down. However, in some cases the garage door spring may snap while the door is up or in motion. If this should happen the door will come down rapidly. For the safety of you and your family, it is best if you do not attempt to move or operate your door in this condition. A garage door is extremely heavy and can cause significant injury. Call the professionals at Sears Garage Solutions to help. A common cause of a garage door off track is one or both of the garage door cables breaking. A garage door cable may break after years of use and natural wear and tear. Typically, a cable will break only on one side of the garage door track at a time and during the process of opening. Aside from the garage door cable breaking there are two other ways a garage door may become off track, sometimes garage doors come off track due to an obstructed path or the garage door being hit by a car or other powerful force. Most garage doors today have electric eyes to insure the path of the door is clear however some older garage doors may not. A garage door without electric eyes allows the opportunity for a trash can, ladder, bicycle, car, etc., to be left in the path of the garage door. Once the garage door makes contact with the object it could knock the door off track. A garage door can also become off track from an impact to the front or back of the garage door. In example, if someone should attempt to back out while the garage door is closed or by driving into the front of a closed door. Quick response, fast repair, painless. Great!